Lower for value funds (about 1.3%) than growth funds (about 3.2%). Lower for small-cap funds (about 1.6%) than large-cap funds (about 1.9%). While the average value mutual fund manager outperforms by about 0.4%, the average value investor underperforms by about 0.9%. While the average small-cap mutual fund manager outperforms by about 0.8%, the average small-cap investor underperforms by about 0.7%. The average annualized loss to investor timing is much lower for the fifth of funds with the lowest expense ratios (about 1.3%) than the fifth with the highest expense ratios (about 4.0%). The average annualized loss to investor timing is a little lower for funds aimed at institutions/retirement funds (about 1.8%) than those aimed at retail investors (about 2.0%). 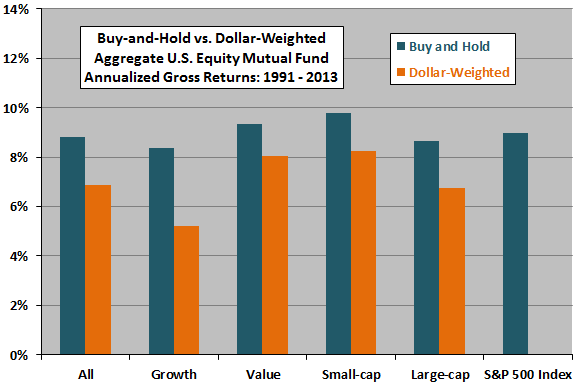 The following chart, constructed from data in the paper, compares gross average annualized buy-and-hold and dollar-weighted returns for U.S. equity mutual funds overall and for value-growth and size styles during 1991 through 2013. For reference, it also shows the annualized return of the S&P 500 Index as a proxy for the broad U.S. stock market. Dollar-weighted returns (those actually experienced by investors) are materially lower than buy-and-hold returns for all fund types, and gross dollar-weighted returns are lower than the market return for all fund types. In summary, evidence indicates that the timing practices of U.S. equity mutual fund investors generate a penalty of about 2.0% a year relative to buying and holding the funds. As noted, most results are gross of fund expenses. Accounting for these expenses would reduce reported returns. See objections to the dollar weighting approach used in “Dollar-weighted Returns for Equity Investors”. See also “Returns for Investors (Rather Than Markets)” and “Actual Return Experience of Hedge Fund Investors”.